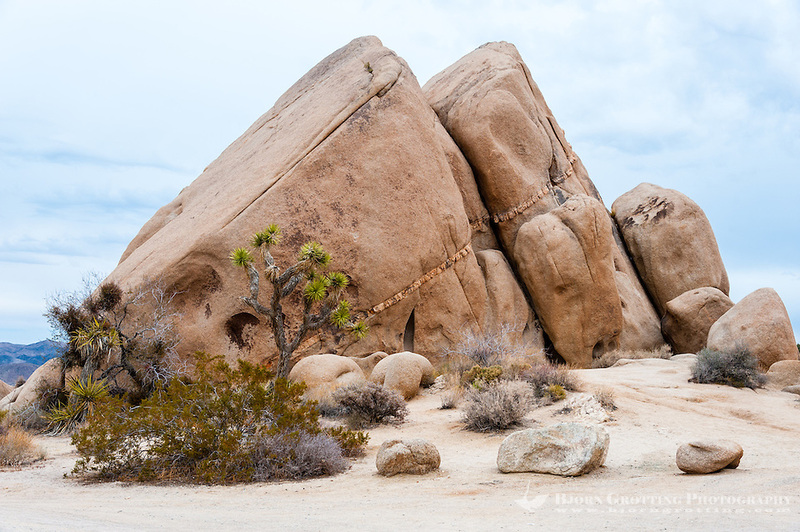 The fascinating Joshua Tree National Park in California represents three different ecosystems; the Mojave Desert to the north, the Colorado Desert which occupies the eastern and southern parts and finally The Little San Bernardino Mountains. As the name suggests the park can offer large habitats with the characteristic Joshua tree, mostly found in the western parts of the park. Similarly fascinating is the geologic formations found here, almost like somebody has been sculpting them. 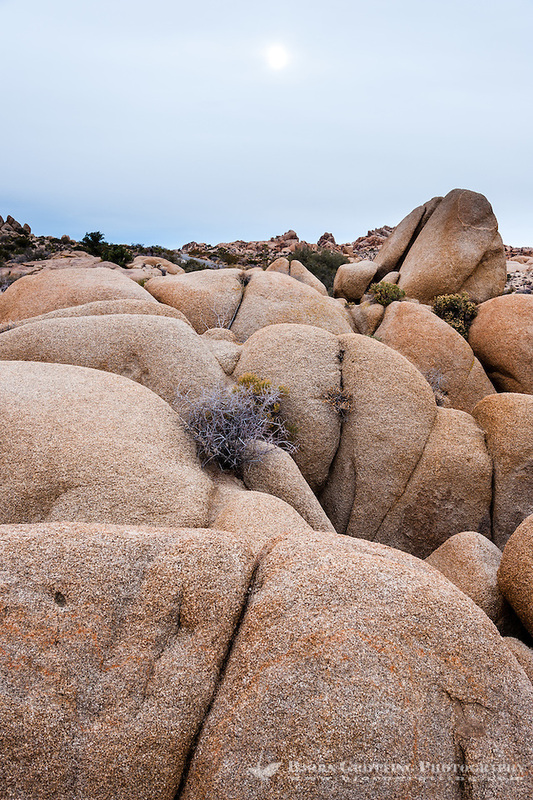 The rock formations have appeared over a period of millions of years, exposing a granitic rock called monzogranite. It all started more than 100 million years ago when molten liquid was forced upwards and cooling down just below the surface. Rectangular stones have since slowly weathered to spheres of hard rock by the ground water, just like an ice cube would do under running water. The exposed parts like the corners rounds away first, this happened over million of years in a much wetter climate. 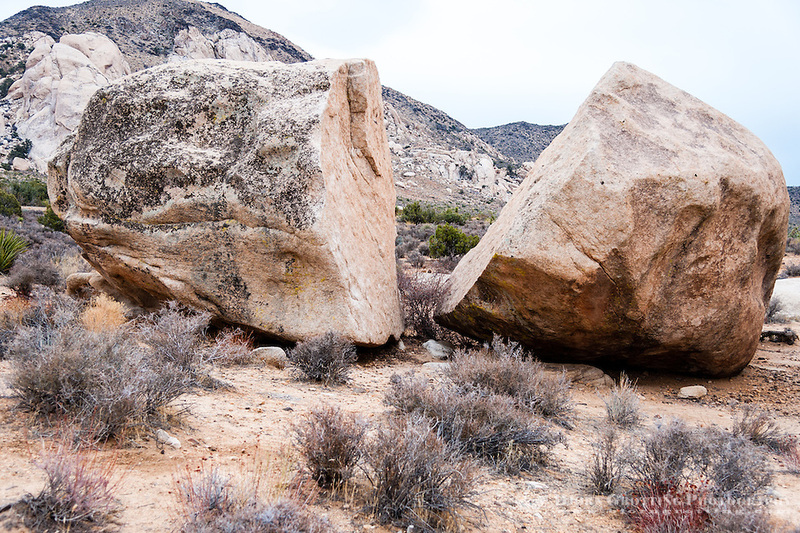 The dry climate of recent times brought flash floods that washed away the ground surface and exposed the huge eroded boulders, like we today can see on sites like Jumbo Rocks. Water is the main dynamic process that erodes rock material, but also wind may play a small role. The erosion and sculpturing of the rocks is therefore still an ongoing process, but to a much smaller degree than during past times with more rain and lower temperatures. 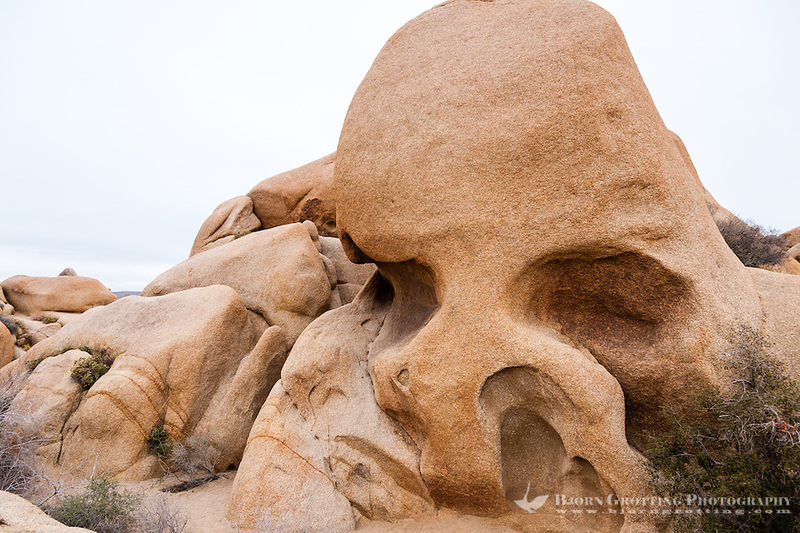 One of the most famous rock formations is the Skull Rock, easily accessible along the main east-west park road. Rain drops have carved out two depressions, which grew in size as more water accumulated. 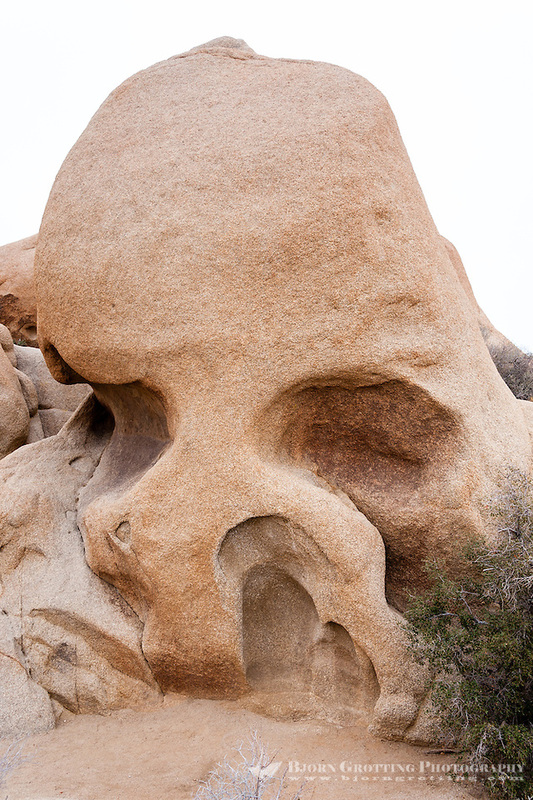 Finally the two depressions resembled eye-sockets, making the rock look like a skull. 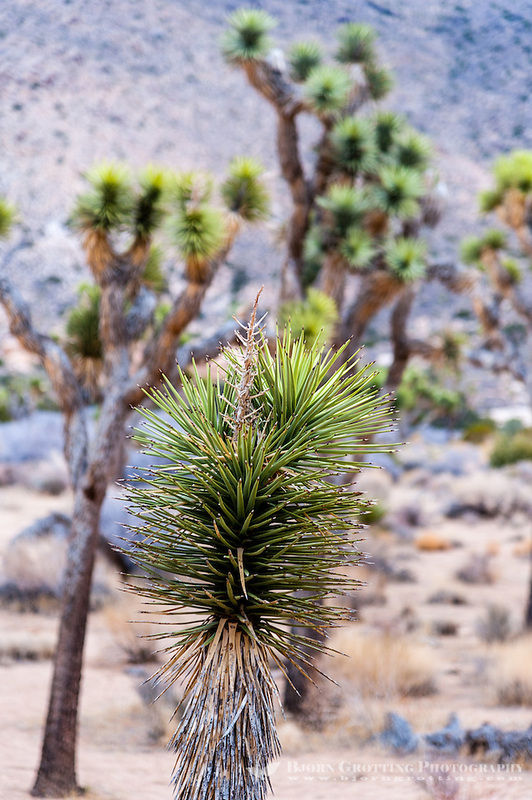 The most characteristic vegetation here is of course the Joshua tree (Yucca brevifolia). The name was probably given by Mormon settlers crossing the Mojave Desert in the mid-19th century, reminding them of a biblical story. It’s branches and trunks has been utilized for fencing and fuel. The trees are growing fast compared to other desert plants, and can live for hundreds of years. The roots can stretch up to 11 meters away from the tree. 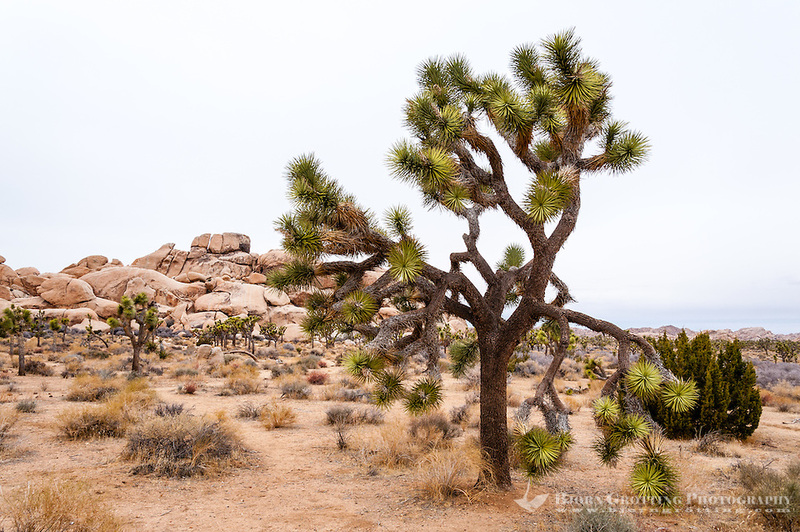 The Joshua tree is endemic to western Arizona, southeastern California, southern Nevada, and southwestern Utah, and is a major indicator species for the Mojave Desert. Some tourists come her to look for the actual Joshua tree that was featured on the back sleeve of the U2 album by the same name, photographed by the famous Dutch music photographer Anton Corbijn. Rolling Stone put the album on the “100 Greatest Album Covers of All Time” list. Unfortunately the famous tree fell down in 2000, and was not even close to be located in the park area. In fact the location is over 320 km (200 miles) away. This misconception probably led to a tragic death in 2011 when Guus van Hove, a Dutch director, and his girlfiend died of heat stroke when looking for the tree in a remote part of the park. The park has a rich variety of birds, more than 250 species have been registered here. There is also a relatively rich wildlife like snakes, bighorn sheep, kangaroo rats, coyotes and black-tailed jackrabbits. There are nine campsites in the park, like Jumbo Rock and Hidden Valley. Some you will need to reserve, and some are first-come first-serve. This is a very popular rock climbing area, with lots of named climbing routes on the relatively low granite rocks. Some of the best panoramic views of the Coachella Valley to the south can be seen from Keys View in the Little San Bernardino Mountains. 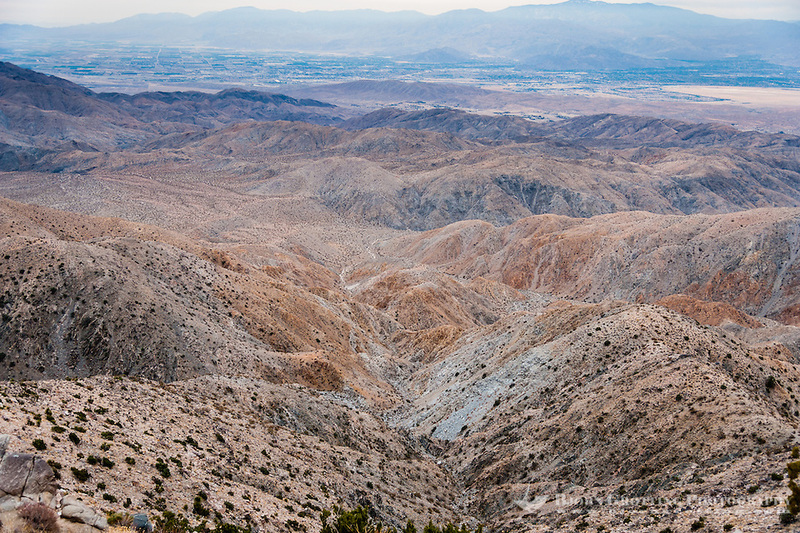 From here you can see the famous San Andreas Fault running through the valley below, the Salton Sea and several high mountains on the opposite side of the valley. It is a 20 minute drive from the main road, but well worth the time. 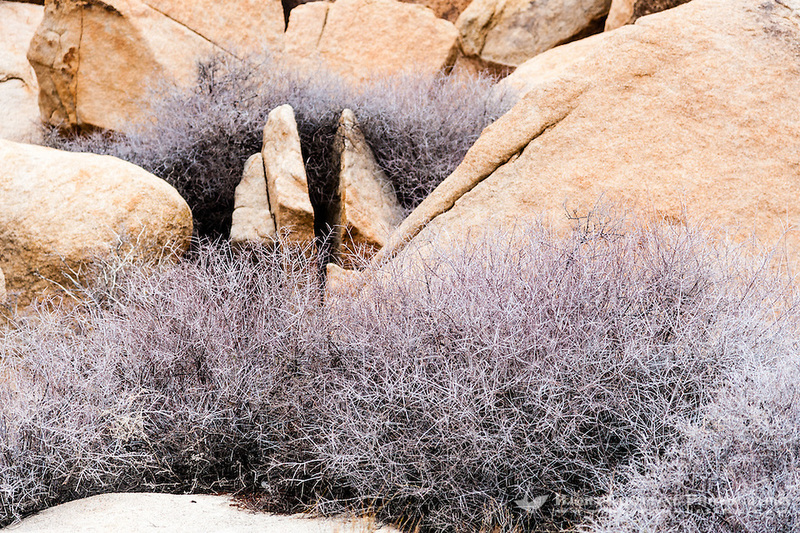 Joshua Tree National Park can be visited all seasons of the year. Visitor centers are located along the main roads leading into and through the park, a small fee also provides you with maps and info about the park.